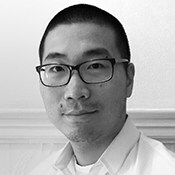 Peter Suen received a Masters of Architecture from U.C. Berkeley, where he was an Eisner Prize and Henry Adams AIA Medal recipient. At Berkeley, he was also a member in the BIOMS group where he worked on multi-disciplinary teams that included engineers, physicists and architects. As a Research Specialist, he worked on advanced facades including self-regulating membranes and microlens arrays for greywater disinfection. In his own research, Peter has been particularly interested in the role of the architect as a designer of information and how that can have a direct impact on how we live. He has focused on different systems of intelligence, from analog computation to living slime mold, and sought to understand how these systems can process information differently from human designers. Peter worked both as an intellectual property attorney and as a software developer. He received a JD from Stanford Law School in 2002 and a Master of Science in Computer Science from Carnegie Mellon University in 2004. Working in San Francisco, he has had the opportunity to work on a wide range of projects from tiny micro-apartment lofts to large winery developments.